Backing up data, in preparation for recovering from a disaster, has been a problem for IT teams for many years due to problems with tape technology and the time-consuming manual processes that it requires. Microsoft Azure solves them all with their cloud snapshots. Backing up data, in preparation for recovering from a disaster, has been a problem for IT teams for many years due to problems with tape technology and the time-consuming manual processes that it requires. New technologies for disk-based backup, including virtual tape libraries and data deduplication, have been instrumental in helping organizations reduce or eliminate the use of tape. Meanwhile, snapshot technology has become very popular with IT teams by making it easier to restore point-in-time copies of data. The growing use of remote replication with dedupe backup systems and snapshot solutions indicate the importance IT teams place on automated off-site backup storage. Nonetheless, data protection has continued to consume more financial and human resources than IT leaders want to devote to it. The Microsoft HCS solution from Microsoft replaces traditional backup processes with a new technology—cloud snapshots, that automate off-site data protection. 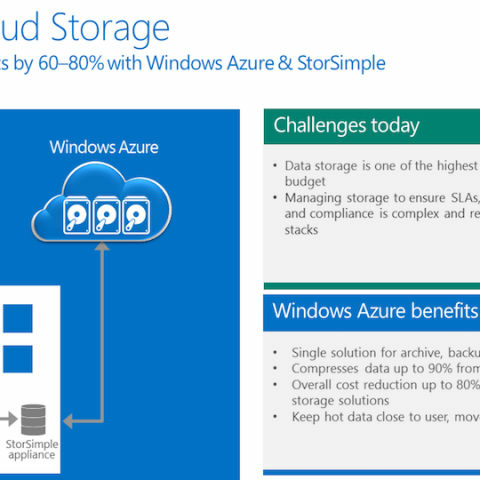 The integration of data protection for primary storage with Windows Azure Storage transforms the error-prone tedium of managing backups into short daily routines that ensure nothing unexpected occurred. More than just a backup replacement, cloud snapshots are also used to quickly access and restore historical versions of data that were uploaded to the cloud. One of the key technology elements of the Microsoft HCS solution are granular data objects called fingerprints, which are created by the integrated dedupe process. This Microsoft HCS solution tracks all fingerprints on premises and in the cloud with a system of pointers that provide disaster recovery capabilities as well as the ability to recover Microsoft HCS solution forms a hybrid cloud management system that is leveraged to provide functions that supersede those of backup systems grounded in tape technologies and processes. Our next Microsoft Azure article would continue the discussion by showing how the hybrid data management system enables deterministic, thin full recoveries of data from Windows Azure Storage.